This article reviews the international provisions applicable to the protection of geographical indications of origin (GIs) and elaborates on the benefits of GI protection for local development and consumer information. Yet, this article supports that these benefits are dependent on a strict linkage between the GI-denominated products and the territory from which they originate. This article also highlights how the current definition of GIs has loosened this linkage and criticizes this development. In particular, this article supports that today GIs have essentially transformed into marketing tools, which can play a strategic role in international trade in agricultural, food-related, and other products due to the competitive advantage that GIs can grants because of the evocative power that is embodied in the geographical terms. This development, however, questions the theoretical premise for protecting GIs as intellectual property rights altogether. Ultimately, this article advocates against this development and calls for a stricter enforcement of the territorial linkage between GI-denominated products and the terroir. In this article, I restate the arguments that I made in two previous publications: “In Territorio Veritas? 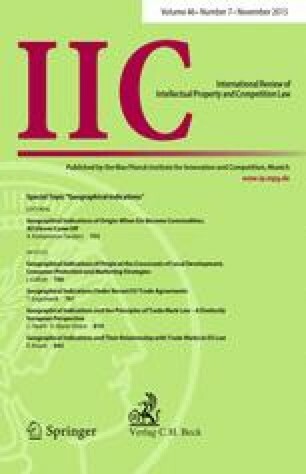 Bringing Geographical Coherence into the Ambiguous Definition of Geographical Indications of Origin”, 6 WIPO Journal 57 (2014); and “Of Markets, Culture, and Terroir: The Unique Economic and Culture-Related Benefits of Geographical Indications of Origin”, in: Daniel Gervais (ed. ), Research Handbook in International Intellectual Property, p. 433 (Edward Elgar, 2015). Accordingly, parts of this article adapt parts of the text and the references from these previous publications.